Have you ever watched one of those telly programmes where someone buys a car or house? To be honest, you'd be doing pretty well not to have seen one of them, as they constitute approximately 80% of all TV content these days. Whether you like that sort of thing or not, there's always a sense of "I wonder what happened next" when the end credits roll. Every now and then they'll go back to visit those people who bought that lovely barn conversion in Devon, or that G-Wagen off Give Us Yer 'And!!! Brewer, just to see how they're getting on. When they do, you find that you hate them even more than you did the first time around, especially when it turns out that they haven't yet fallen on hard times. But then again that might just be Shed, who is quite a grumpy person. 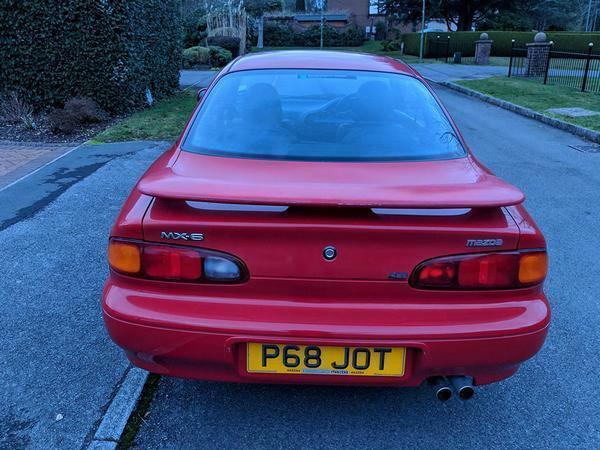 Anyway, with this Mazda MX-6 we are able to trump all these lazy telly types by bringing you Shed of the Week's 'where are they now' update. Not with this particular example, admittedly, but rather with the dark blue one covered in this Readers' Cars thread which, a few months before PHer XJ40 (later Mycroft Ward, now MX6) started writing about it, had been featured in SOTW. 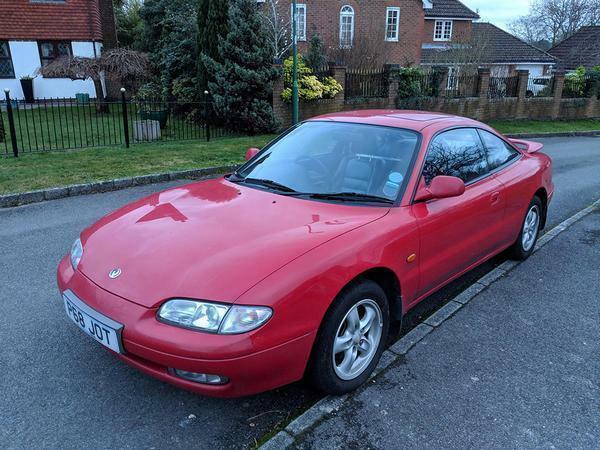 We thought we'd give you a link to it as it gives you the chance to bone up on what life with an MX-6 might be like. 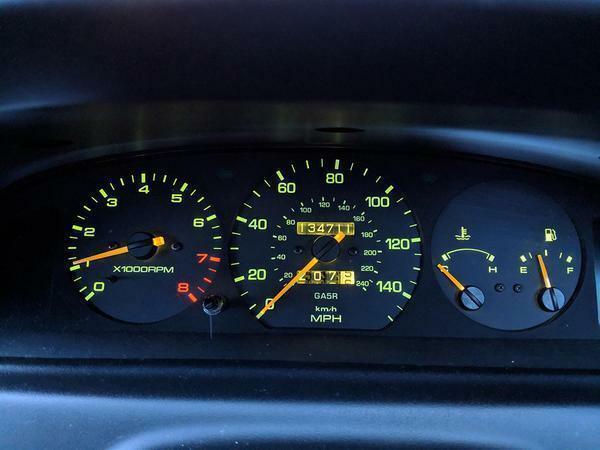 When MX6 bought the non-historied SOTW in November 2016 it had done 158,000 miles. After clearing out his inspection pit in readiness for a home service and the fitment of a new cat-back exhaust (the old one was rusty) he got some PH advice on an intermittent hot starting problem (PH-diagnosed as either battery earthing issues or the 6's famously leaky cam covers oil-fouling the HT leads). He also fitted a nice set of anthracite five-spoke RX-7 alloys (since replaced by Volk GTP split-rims) and dropped the ride height by 35mm. By February 2017 MX6's fettled MX had become a PH Reader's Car of the Week. By the following month he had it back on the road having home-repaired the car's unusual spring-loaded VAF vane airflow gizmo. Unfortunately, that was a cost-saver too far as it failed its MOT on emissions, having failed a year earlier on the same grounds. Undaunted, two and a bit years on, MX6 continues with the project - and how. He's done a huge amount of induction and fuelling work, with turbocharging on the agenda, all for remarkably small amounts of money. It's a fabulous low-cost/high-quality build thread on which Shed has just happily lost a couple of hours. One of the shoutiest points arising from the forum posters on that April 2016 SOTW piece was RUST, and MX6 has had some of that underneath and on the arches and sills of his blue car. 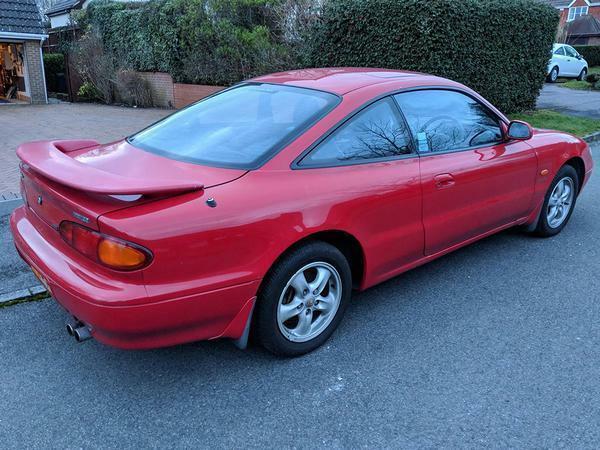 The one thing that comes across from his Reader's thread however is that the MX-6 is a very viable project car. Working on it seems relatively straightforward and the parts are readily available. He paid the princely sum of £83.42 (including postage) for all the bits needed for a cambelt change (three belts, idlers, tensioner and water pump). The current owner of this red car is saying all the right things - garaged much of its life, mechanically sound, belts done in the last 3,000 miles, and most crucially no signs of rust. 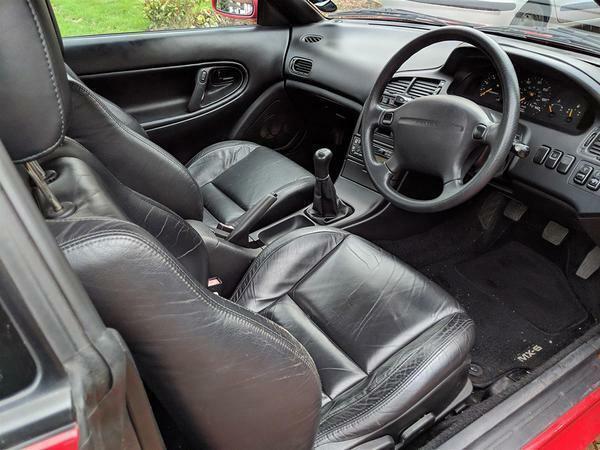 He does fess up to some lacquer peel and a bit of seat bolster wear, but most of us would regard this sort of thing as very much par for the course on a 23-year old Japanese motor. The good things about the MX-6 engine are that it is a V6 with lots of tuning potential and that it slots quite nicely into an MX-5, where it will deliver more than adequate performance. In the bigger (but still not overly lardy) MX-6, you'd call it more relaxed than urgent. Even Mazda thought that, claiming a conservative eight-plus seconds for the 0-60 time in period. Evidently the press cars had something about them as Autocar managed to get it through the 0-60 run in 7.5-seconds, while another UK mag reputedly got it down to 7.2. 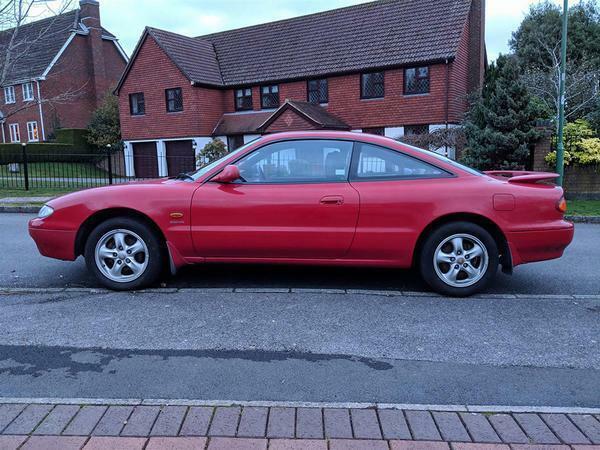 That same mag gave the MX-6 the overall win in a five-car group test against the Honda Prelude, BMW 325i, Nissan 200SX and Vauxhall Calibra Turbo. So spend a bit of time and money on it, as MX6 has, and you could come out with a rather lovely engine. Here's what it sounds like on individual throttle bodies. With this sort of stuff nailed on, along with the right headers and ECU, figures of 230hp are easily attainable. Turbo or supercharging are both very realistic options, too. Not everyone loves the boomerang boot lid spoiler. Just imagine this red one with that (and any boot lid rust) removed, a non-granddad steering wheel fitted, and a set of BBS-style lattice alloys bolted on. Or you can just enjoy it as it is, a cruiser from a golden age of coupes that still looks graceful today - and that could look utterly amazing with the right mods. At the very least it's a nice all-rounder which, assuming the dreaded rust hasn't taken hold, shouldn't lose too much value. But that is a big assumption. And if it does get written off, all is not lost. If you can find a 51-year-old writer called Peter, Paul or anything else beginning with a P, you might get a few bob for the reg number. Love the looks of these and always have done ... for some reason though I thought these were auto-only, god knows why! 6 cylinders again. Nice one shed! Sister car to the Ford Probe and co-developed. Likewise, great looking cars. I was a uni when they were new and one was often parked outside our student house. I always thought it looked like something much more exotic.